The Code of DCC.. Read and Despair! Downtime. Oh what to do! 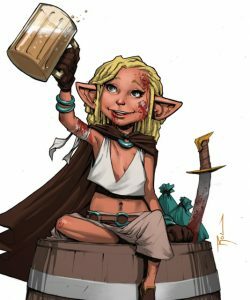 Growing up in the village of Cloverdale, like many halflings her only real ambition is to enjoy of much of life as possible, preferably with somthing tasty or hallucinogenic, (real life is fun but why not add more colours?) she realised that workng for those things is no fun so why not just share them with others regardless of who owns them. After people grew tired of involuntarily sharing items and insisting on payment she relieved the mayor of a few shiny objects to help pay but this did not go over well either. So she was forced to flee and that set her on the road to the beggining of our adventure. DCC Facebook Group GMs mainly but all are welcome! Knights In The North Great site for DCC & OSR fan designed stuff. Official Goodman Games Downloads Basic page but chock full of goodies ! Purple Sorcerer DCC Tools Invaluable Website for any DCC fan.